Same shape and construction as the 1177 model, this pull on favorite with truck drivers is another hard working Red Wing. More suitable to drier conditions than the 1177 oil tan will wear and wear just as long. Can be repaired easily if damaged. The Chelsea Rancher boots was developed for American sheep ranchers while our Iron Ranger boots were built for American iron miners. Both styles grew to great popularity and today have been combined into the Chelsea Ranger. 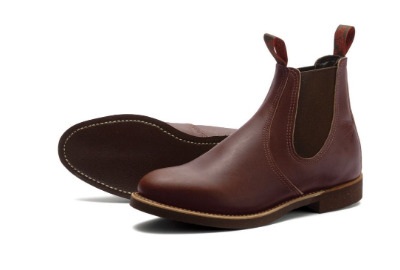 This boot marries the comfortable upper of the Chelsea Rancher with the durable and sharp-looking sole of the Iron Ranger. 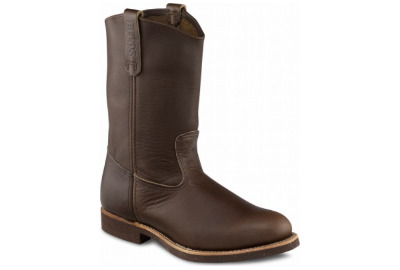 The 8201 features Goodyear welt construction and Amber Harness leather. The top seller of almost half a century. Worn by stockmen, miners and the man in the street alike For anyone requiring a long wearing tuff boot, this 11" oil tan pull on is a proven performer. An extra wide EEE last and an oak leather in-sole add to the strength and durability of the welted cork fleck sole. 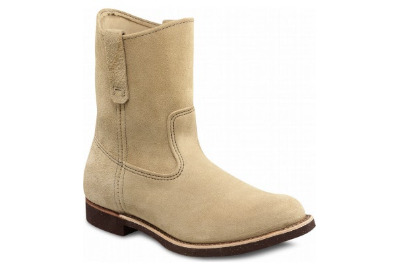 Made in the USA by Red Wings skilled craftsmen and woman.